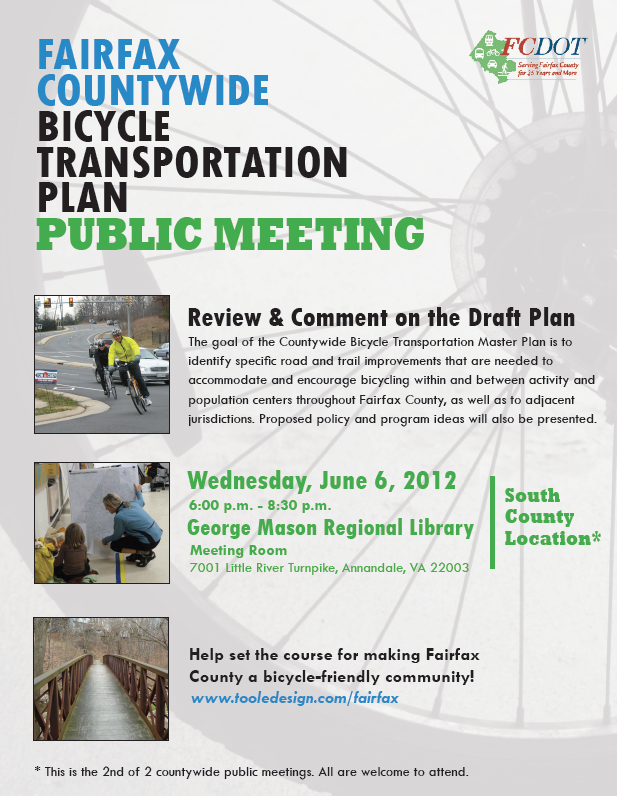 Fairfax County just announced the final two countywide public meetings on the Bicycle Master Plan. 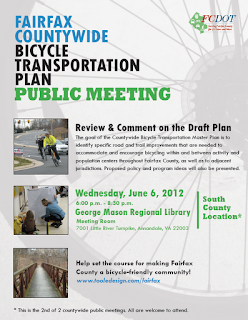 The North County meeting is June 5 in Reston and the South County meeting is June 6 in Annandale. The final draft proposed route network will be presented along with policy and program recommendations. This is the last opportunity to ensure that recommendations you made during the development of the plan are included in the route network or policy recommendations. The plan has been under development over the past year. Several FABB members are on the plan advisory committee and FABB was represented at all of the area meetings and the thematic meetings. Tuesday, June 5, 6:30 - 8:30 p.m.
Wednesday, June 6, 6:00 - 8:30 p.m.